The following links will bring up these recent papers (in .pdf format) using Adobe Reader/Acrobat. If you do not have Adobe Reader 6.0, you can download a free copy from adobe.com. Deuterium enhancements of 1010 observed in Large Dark Nebulae, LDN1689N, (Roueff et al. 2005), heavy elements detected by Galileo probe and revealed by S-L 9 impacts, suggest the giant planets accreted slow and cold (< 50o K), as solid, highly deuterated Methane Gas Hydrate (MGH), (CH4)4(H2O)23. These alone comprised the nascent planetary system. Jupiter incorporates 318 times the known element abundances on Earth, distributed homogenously throughout (δ=1.33 versus pure MGH, δ=0.9 g/cm3). A 6,000-year BP impact on Jupiter initiated a nuclear fusion explosion, ejecting proto-Venus plus the Galilean moons, expanding the incandescent atmosphere of Jupiter tenfold, initiating a continuous fusion reaction in the impact crater to this day. A hot plasma plume from this reaction (Juno) originally extended 2 x106 km from the impact site at 22o S Latitude, producing all asteroids in inclined orbits, including millions (Trojans) orbiting about L4 and L5. It diminished over ~6,000 years, blasting the Galilean moons every nine hours, producing the higher densities and temperatures of the inner moons, confirming the high deuterium content of the giant planets. The ejections of Mars, Earth and Venus and the subsequent plumes slowed Jupiter's rotation period from ~5 (Hoyle, F. 1979) to 9.9 hours. The fusion on the surface, ~700 km below the cloud-tops, has diminished to the lowest temperature reaction known: d + p → 3He++, producing ~1032 (4.98 MeV) helions/s which rise, delineating a hot vortex due to the Coriolis effect. The expanding vortex lags the rotation of Jupiter, appearing ~50,000-km to the west, exiting Jupiter as the Great Red Spot (GRS). The elements continually being released from the MGH by the fusion reaction, react within the hot vortex to form crystalline aerosols, producing Jupiterfs equatorial bulge, excess luminosity and tinged clouds - CS crystals color the GRS. JunoCam polar images suggest these particles extend to +/-70. Latitudes, poleward of which a blue ocean, from surface MGH melted by the auroras, is revealed. Figure 1. Helion trajectories - yellow produces magnetodisk magnetic field, blue the auroral ovals. 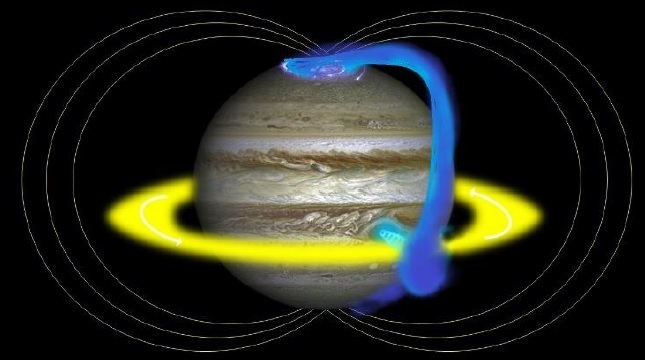 The exiting vortex merges with the existing helion stream circling Jupiter prograde (yellow), currently recognized only as the 'inner radiation belt', imparts the angular momentum of the planet and adds helions replacing those being lost. The helion stream constitutes 3.2 x 1022 amperes. It is tilted relative to the equator due to its origin at the GRS and the rotational velocity of Jupiter. The helion-ion stream produces Jupiter's powerful magnetodisk-shaped magnetic field, unobstructed by the solid body of the planet. A portion of the helion vortex exiting the GRS passes through the circulating stream at the 'hot spot' (O'Donaghue et al. 2016), is captured in the external magnetic field and deflected helically to the poles (blue) producing the constant auroral ovals. The far UV of the ovals are the Lyman forest of the helion vortices, edge ~228 Å, impacting the atmosphere at 17,800 km/s and capturing electrons. 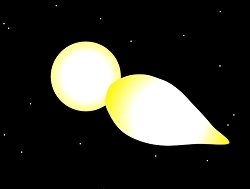 The ovals delineate the helion trajectories while poleward sporadic flashes are due to ions carried within the vortices. The oval helions remain in space less than 30 seconds and the circulating ones are lost in less than 60 seconds. The losses are balanced by the production rate. Equatorial and polar helions produce cyclotron/synchrotron radiation. The solid, frozen MGH body of Jupiter cannot generate an internal magnetic field. But given Jupiter is the origin of the terrestrial planets, it contains ~318 times the mass of the iron/nickel in the Earth, uniformly distributed throughout its interior. As a result, Jupiter resembles a large, weak permanent magnet, the field of which is induced by the 'tilted' circling helion stream, offset from the geometrical axis. The helions that produce the auroras (blue) follow the induced magnetic field lines nearer to the surface than the Juno orbit. JEDI possibly detected the lower end of the helion energy distribution on PJ 1, but their doubly charged state interfered with the TOF measurement, resulting in the qualified identity of Mg/Na (Haggerty et al. 2017). Anomalies in the medium wavelength gravity and magnetic field data, currently interpreted as due to atmospheric and subsurface flows (Galanti et al. 2017), suggest large basins, flooded palimpsests produced by ancient impact explosions. These cannot be fit by spherical harmonics, which assume hydrostatic equilibrium (gas giant), as indicated by non-zero odd (J3) harmonics (Bolton et al. 2017). Coincident magnetic field anomalies are due to the iron/nickel ejected by the same impacts. The multiple atmospheric zones and belts are the surfaces and junctions, respectively, of wind vortices (Coriolis) spawned by the extended hot vortex and constrained by the solid surface of Jupiter ~700-km below the cloud-tops. The north EZ is cloud-free because the Coriolis effect in the equatorial jetstream becomes vertical at the equator and supplements the centrifugal force, ejecting the solid aerosols, preventing those in the south EZ from crossing to the north. The Juno gravity experiment is indicating a large 'stable' homogeneous mass distribution of Jupiter, well beyond 0.9 RJ as suggested herein, rather than the massive rocky-iron core required in the 'gas giant' hypothesis. * Venus - A Young Earth - July 2017 Summary: Overwhelming physical evidence has been present for thirty-seven years that Venus is a hot new planet, born from an impact on the solid, highly deuterated, methane gas hydrate Jupiter 6,000 years BP. Impacts of large bodies on Jupiter trigger enormous nuclear fusion explosions which eject the full range of atoms in their known relative abundances, forming the terrestrial planets. Due to the great heat of these explosive ejections the atoms are reduced to a plasma comprising electrons, protons and neutrons, from which similar abundances quickly reformed, but with the nuclear decay clocks of radioactive elements reset to zero, producing the primordial isotope ratios of argon and hydrogen found on proto-Venus. Venus today demonstrates that the heavy elements quickly condensed to form what will become the mantle of a complete terrestrial planet. 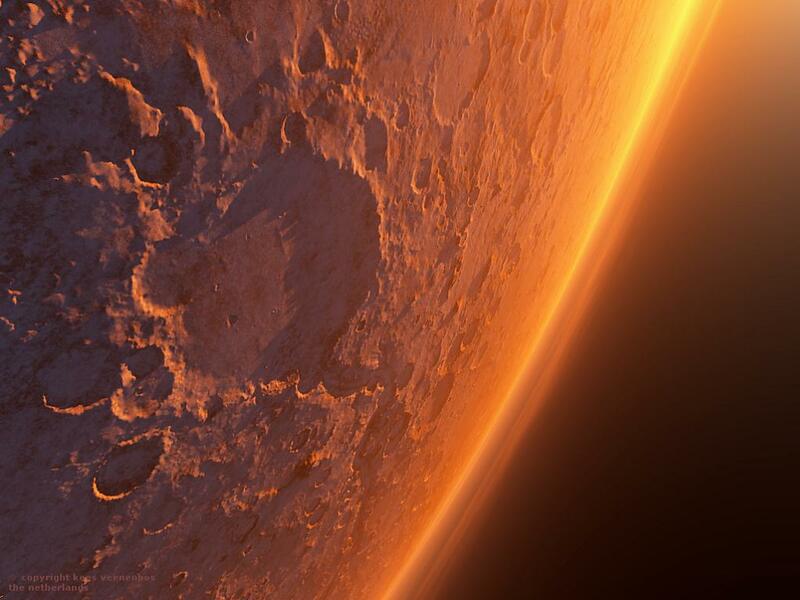 Its current orbit is the result of multiple close encounters with Mars and Earth, raising the Tharsis Bulge and the Himalayas, and on Venus uplifting Aphrodite and Ishtar Terra, which display no volcanic calderas. The interior is completely molten with a thin basalt layer less than two kilometers thick floating on top, evidenced by its lack of rotation. Proto-Venus’ enormous internal heat is manifested by raw incandescent lava, > 2000º C, lying in myriads of cracks in the surface, fleeting views of which by the Pioneer Venus Large Probe Infrared Radiometer produced high intensity erratic signals dismissed as window heater faults. Up-welling vs down-welling radiation measurements from five independent Pioneer Venus probes all agree that proto-Venus is radiating 20 watts per square meter, 250 times more energy than the Earth. Integral to the cooling process, the primary transfer of heat from the surface to the lower cloud layer is accomplished by the high velocity jetting of sulfur gases from more than one million ‘small domes’ directly to 48 km altitude where S8 crystalizes in three forms comprising the lower cloud layer. This unique, 2 km thick, roiling, mixed-phase stratiform cloud layer is the most ubiquitous atmospheric feature on the planet. Sulfur compounds raining back onto the surface evaporate, controlling the surface temperature. The massive lower atmosphere, primarily sulfur, SN, and CS, currently mistaken for CO2, capped by the lower cloud layer are the source of the high surface pressure, 92 bars. This layer will settle to the surface of the planet as it cools, adding to the existing mantle. The temperature and pressure immediately above the lower cloud layer are similar to those at the surface of the Earth. The volatile elements currently found above the lower cloud layer represent a tiny fraction of the total produced by the 6,000 year (BP) impact explosion on Jupiter, the remainder of which orbit invisibly in the inner solar system awaiting capture. These will form the lithosphere, crust, oceans, atmosphere, flora and fauna of a new terrestrial planet. A relatively simple, inexpensive, mission to verify this hypothesis is proposed. Two probes, for redundancy, would be released from an orbiter (or even a flyby), each carrying visible light cameras which would photograph the surface of Venus once they descend below the opaque lower cloud layer and the red haze to ~30 km altitude, where temperature and pressure are not severe. Another camera would be used to photograph microscopic images of sulfur crystals collected on cool glass plates as the probes fell through the lower cloud layer. The images would be transmitted to the bus and back to the Earth. * Jupiter - Gaseous or Solid? Ask Juno - May 2017 Summary: Deuterium enhancements of 1010 observed in Large Dark Nebulae (LDN) and heavy elements detected by Galileo (C, O, S, Ar, Kr and Xe) suggest the giant planets in the solar system accreted slow and cold (20o K) from snowflakes and dust at their current orbits, forming frozen, highly deuterated Methane Gas Hydrate bodies (MGH), together comprising > 300 earth masses of water. These alone comprised the original solar system. Jupiter incorporates the heavy elements as dust grains, which are uniformly distributed throughout the solid planet resulting in Jupiterfs high density, 1.33, as compared with pure MGH, 0.9 g/cm3. A recent (6,000 years BP) high energy impact on Jupiter triggered a massive nuclear fusion explosion of the local deuterium, which ejected proto-Venus plus the Galilean moons. The impact also expanded the incandescent atmosphere of Jupiter tenfold, initiating a continuous fusion reaction in the impact crater. A hot plasma plume from this reaction, named Juno in Roman myth, originally extended 2 x106 km from the impact site at 22 oS Latitude, beyond Callisto, rotating rapidly with Jupiter. It slowly diminished over ~ 5000 years, sweeping over the Galilean moons every eight hours, resulting in the higher densities and temperatures of the inner Galilean moons. The longevity of the plume confirms the high deuterium content of our giant planets observed in a number of Large Dark Nebula such as 1689N (Roueff). The fusion on the surface, some 700 km below the cloud-tops, has diminished to the lowest temperature reaction known: d + p ¨ 3He+ + ƒÁ , which alone is producing Jupiterfs atmospheric temperature excess, enormous magnetic field, constant auroral ovals, and its multiple zonal wind bands, actually vortices, constrained below by the solid MGH surface. The reaction is generating 1030 relativistic 3He+ ions per second, which rise in a hot vortex, due to the Coriolis effect. It is swept west below the clouds some 20,000-km due to the rapid rotation of Jupiter, exiting the atmosphere through the Great Red Spot along with the standard abundances of heavy elements which are continuously being released by the heat of the fusion reaction. This results in a hot equatorial wind superrotation sensed by the MWR, but interpreted as a pancake layer of ammonia in the interior of a egas giantf. A etornadof of helium ions exits through the Great Red Spot, impacts the 3He+ ion plasma cloud that orbits Jupiter (prograde), imparting the angular momentum of the rapidly rotating Jupiter and adding ions to replace those being lost to space. The positively charged cloud external to Jupiterfs generates powerful magnetosphere unencumbered by the solid planet. Jupiterfs magnetic field is opposite the field of the Earth, with north magnetic field corresponding to north geographic pole due to the prograde circulation of positive ions in the cloud. The highly energetic helium ions (24,000 km/s) which pass through the plasma cloud at the OfDonaghue ehot spotf are captured in the external magnetic field and deflected helically to the poles creating the constant auroral ovals. The ovals are constant because the fusion reaction is constant. The 3He+ ions are stable and produce no recombination radiation but their spiraling is observed as partially polarized decimetric synchrotron radiation observed from Earth, currently believed to be due to electrons. 3He+ ions have a theoretical hyperfine transition between ground states at 3.46 cm which cannot be detected by any instrument on Juno. However, due to their great numbers surrounding Jupiter, they could easily be detected by radio telescopes on Earth supporting the mission. The solid MGH body of Jupiter cannot generate a magnetic field, but due to the known uniformly distributed abundance of iron in dust particles, 318 times that of the iron on Earth, it acts as a large weak permanent magnet induced by the external magnetic field, offset from the geometric axis. This has resulted in the unexpected features of the magnetic field near Jupiterfs surface. The JEDI energetic particle detector has failed to identify the relativistic 3He+ ions with velocities as high as 24,000 km/sec surrounding Jupiter because it is too small to measure their time-of-flight. On every pass, all channels of the MWR radiometer experiment are detecting heat from the same atmospheric vortex circulating on the solid MGH surface of the planet (Figure 8), but due to the current insistence on the egas giantf hypothesis the data is being interpreted as a layer of ammonia at the equator within the gas planet. The radiometers are passive receivers, not radar or spectrometers. The Juno Radio Science (gravity) experiment is already indicating a large "stable" homogeneous mass distribution of Jupiter rather than the rocky-iron core imagined having formed rapidly and attracted all the hydrogen before it escaped the system. The complexities in the medium wavelength gravity results, currently thought to be due to deep flows, are indicative of the very large basin or flooded palimpsest produced by impact explosions, the latest of which surrounds the fusion reaction, also an east-west ice mountain range below the hot vortex at 22 º S Latitude to the east of the GRS, formed due to the raining out of water released by the heat of the fusion as it rises, expands and cools. A crucial event for Juno will occur on July 11, 2017, when Juno will pass over the GRS, being exposed to the 'tornado' of 1030/sec relativistic 3He+ ions. Unaware of the danger, the Juno team may try to look down into the spot with the radiometer, because in the 'gas giant' hypothesis it is thought to be a passive feature, but this would be disastrous. The radiation will penetrate the titanium instrumentation vault and cause the system to go into safe mode or worse. * On the Local Origin of the CMB Radiation - 2016 Summary: Until recently, cosmologists have had little concern with the solar system, being focused primarily on the power spectrum of small angle temperature anisotropies in what is believed to be the Cosmic Microwave Background (CMB). However, studies of the WMAP sky data have revealed a number of large scale alignments with the ecliptic plane, thereby to the solar system. These alignments have been confirmed in the more recent, precise Planck reports (XV, XVIII) as a deficit in the low-l power spectrum, but no physical basis for such an alignment has been suggested based on the current ‘standard model’ of the solar system. A number of ancient texts indicate that proto-Venus (Aditi, Pallas Athene) was born from the head of Jupiter. That is, rebounded from an enormous fusion-enhanced impact on the highly deuterated, solid, Methane Gas Hydrate (MGH) surface of Jupiter 6,000 years BP. The author maintains that the blast was directed into the inner solar system resulting in a dipole distribution of the heat expanding outward at the speed of light since that date. As a result, current observations are detecting black body re-radiated from 3,000 light-year distant galactic dust with the same dipole nature as the blast. Cosmologists subtract the dipole, assuming it represents the velocity of the solar system relative to the CMB. The multiple alignments of the resulting large scale anisotropies are a direct result of this subtraction, reflecting only natural deviations of the original blast from perfect symmetry. This proposed interpretation of the microwave background inherently solves the 'horizon' problem, with no requirement for 'inflation'. The recent realization that the power in the WMAP anisotropies is systematically greater than in the more recent Planck data suggests a means of corroborating the Jupiter impact hypothesis. If the small anisotropies are from the Big Bang, there should be no measurable change in their power or shape with time. If the microwave background power continues to decrease, the foreground local origin of source will be established. The NASA Juno probe, due to begin a detailed study of Jupiter's interior in mid-2016, has the potential to detect predicted features hidden below the clouds, since the Great Red Spot, the temperature excess, and the multiple zonal vortices are all driven by an active fusion furnace at the center of the impact crater which caused the explosion 6,000 years BP. * Jupiter Gaseous or Solid? - Ask Juno (2015) Summary: When the data from the Galileo probe was returned to Earth, it contained dozens of unexpected findings. These initial findings were supposedly "encouraging scientists to rethink their theories of Jupiter's formation and the nature of the planetary evolution process". But in the ensuing fifteen years, not a single one of these unexpected findings has been explained. In fact, every textbook in the world still states that Jupiter (Saturn, Uranus & Neptune) are 90% hydrogen and 10% helium primarily due to their temperature excesses. Believe it or not, the latest mission to Jupiter, Juno (arriving in mid-2016), is designed primarily to detect the three cloud layers integral to the 'gas giant' hypothesis - even though they were not found by the Galileo probe. As explained in the linked paper, Juno will not find the three cloud layers, but has a good chance of finding specific features which prove that Jupiter et al. are hugh, solid, frozen methane gas hydrate bodies, the temperature excesses of which are limited to their atmospheres. Needless to say, the 'scientific community' is going to find this a difficult pill to swallow and will fight to suppress it, but the alternative is for another generation of young minds to be wasted on old unfounded hypotheses. * An Alternate View of Venus - July 2002 Summary: Venus is a hot new planet due to its recent catastrophic birth from an impact on Jupiter. Evidence presented is based on NASA Pioneer Venus and Soviet Venera data. Its great internal heat is being transferred through the crust by the high speed venting of S8, a staggered ring molecule, via over 200,000 'small domes.' Although S8 dominates the lower atmosphere it was not detected because its mass was beyond the range of the PV mass spectrometer. S8 crystallizes at exactly the temperature of the lower cloud layer. It is the great mass of these heavy molecules and crystals that load the lower atmosphere and cause the high atmospheric pressure (~91 atm.) at the surface, not CO2. Radiation from raw lava exposed in surface cracks was registered by the sensitive radiometer as the main probe passed through the lower cloud layer, but was arbitrarly thrown out by the project scientists "because signals in all channels increased unreasonably." Much of the other data was dismissed or misinterpreted in order to be consistent with the assumed uniformitarian paradigm. * Jupiter - Gaseous or Solid - Oct. 2008 Summary: Jupiter and Saturn are solid methane gas hydrate bodies, not gas giants. Evidence confirming this view comes from the visible features of these bodies, the Galileo atmospheric probe and the Shoemaker-Levy 9 comet impacts. The visible features are all caused by recent high energy impacts on these giant planets. Jupiter's Great Red Spot marks the top of a column hot gases rising from the crater formed by an impact which occurred 6,000 years ago. Proof lies in the fact that it has remained at the same latitude for the 350 years it has been observed. These rising gases spawn and color the zonal wind bands that encircle the entire planet, which themselves imply a solid bounding surface. The gases heat and bloat the atmosphere, producing an apparent temperature excess, while the body of the planet, some several thousand km below the cloud tops remains frozen. The larger Shoemaker-Levy 9 comet fragments penetrated the atmosphere and struck the solid surface, producing shock waves and rising mushroom clouds which resulted in enormous, earth-sized plumes at the cloud tops. Thes 'main events' saturated infrared detectors and exhibited the spectra of many elements frozen in the surface, in quantities impossible to explain by any other hypothesis. * The Origin of Sunspots - Dec 2003 Summary: The enormous impact on Jupiter, which occurred 6000 years ago, ejected a myriad of satellites, including the proto-Galilian moons. But it also initiated an enormous nuclear fusion conflagration of the deuterium and hydrogen from the gas hydrates in the impact crater. This was initially manifested as a great flaming jet which extended more than a million kilometers from Jupiter out into space, sweeping around as the planet rotated. The gases from it coalsced in space as they cooled into unique, cinder-like hydrated bodies of low density while still within the magnetic field of Jupiter. The fate of these bodies depended on the orientation of Jupiter's rotation at any time, so some of this material contributed to the outer layers of the Galilean moons, some of these bodies became main belt asteroids, and many went into inclined, highly eccentric sun grazing, planetary orbits. The numbers of these bodies ranges into the millions, due to the great longevity of the jet which was still ejecting mass from Jupiter into space as late as 1932. As the orbits of the sungrazers decay the larger ones impact the Sun, pushing down the gaseous surface at the point of entry, causing local cooling as they are vaporized, and the material ejected by their impact comprises the Coronal Mass Ejections (CMEs). The impacts set up a circularization pattern in the surface layer of the Sun much like a smoke ring or storm cell, accounting for their (week or two) longevity. The loss of kinetic energy of these fast moving bodies are also responsible for the non-thermal deposition of energy in the chromosphere which attains temperatures of millions of degrees. * The Cosmogony of the Solar System - May, 2004 Summary: The original solar system comprised only the giant planets Jupiter, Saturn, Uranus and Neptune. Dust and gases were swept from the inner solar system in less than a million years. At the snow limit, the dust acted as nuclei for the capture of much of the gas, primarily in the form of water ice. The giant planets accreted from ice crystals in 400 million years as solid, cold, methane gas hydrate bodies. Most gas not captured as ice was lost. Their spots, rings, zonal jets, and temperature excesses, are the result of `recent' high energy impacts. Proto-terrestrial planet material rebounded from similar impacts as a vast hot plasma cloud. Repeated heating (>10^4 K) by tidal and electromagnetic braking at perihelion rapidly reduced their orbits, increased densities by out-gassing of lighter elements, and concentrated iron in their cores. The light elements originally out-gassed, were later recaptured to form oceans and atmospheres. * Egyptian Myth and Catastrophism - September 2008 Summary: This article discusses Egyptian myth in more fascinating detail than any of my other writings. It was surprising to me that Egyptologists are as dogmatic about their interpretations of myth as planetary scientists, which could be considered a ‘softer’ science, but this is obviously true. They refuse to even imagine that their long-accep could possibly be incorrect. They fail to understand the exquisite detail concerning the separation and return of the solid core of priori-Mars at the end of each encounter. Interestingly, the translation of the Book of the Dead which I have used concerning these separations is that of Zecharia Sitchin, of Nibiru fame, who obviously does not understand the physical events it is describing. It is only in the context of the Ackerman catastrophism scenario that the translation makes any sense.